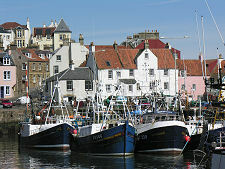 Pittenweem is now the most active of the fishing ports in the East Neuk coast of Fife. Fishing boats jostle for position in its busy harbour and this is a lively vibrant place at any time of day. 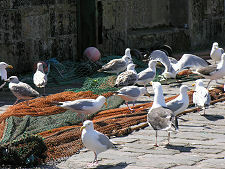 To add to the atmosphere, visitors can watch the fish market conducted in the sheds on the harbour each morning. The harbour is a magnet for visitors. Photographers can take their pick between the brightly-hulled fishing boats or the jumble of red pantiled or grey slated houses. 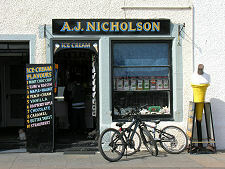 Pittenweem simply oozes charm. Along the harbourside are the local inns, which have served fishermen for generations and no doubt continue to do so. Many of the small houses in the village bear plaques showing that they have been restored by the National Trust for Scotland. 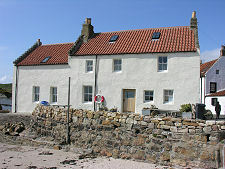 As in other villages in the East Neuk of Fife many houses echo the Dutch style with crow-stepped gables. Viewed from above, the roofs seem to tumble down the hillside to the harbour below. 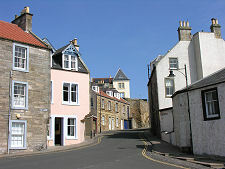 Pittenweem's High Street lies above and behind the harbour. Here you can find the baker's shop and other local traders serving the community and tourists alike, plus an interesting selection of artists' galleries. Kellie Lodging in the High Street is a small townhouse dating back to 1590. Once the home of the Earls of Kellie, it was beautifully restored in 1970. 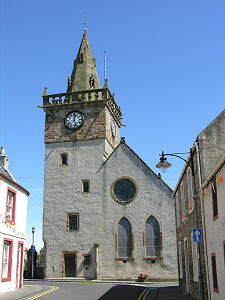 The east end of the High Street finishes with the end gable of the Parish Church, joined in 1588 to the tower of the town's tolbooth now looking very much like the church tower. Parts of the Parish Church date back to the 1300s and originally formed part of the priory church of Pittenweem Priory. This grew out of a community founded by Augustinian monks who came here from the Isle of May in the 1200s. 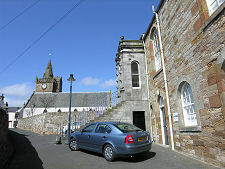 The rest of the priory was eventually incorporated into the fabric of the village of Pittenweem as it developed, and the site of the refectory was used in 1821 for the town hall, since converted to a house. The village name means place of the cave, referring to St Fillan's cave in Cove Wynd, which was used as a chapel by St Fillan in the 700s. The saint reputedly had miraculous powers. He is said to have written his sermons in the complete darkness of the cave, guided only be a glow emitted by his arm. Over the intervening centuries the cave has been largely respected as a shrine, though it was once used to store fishing nets. 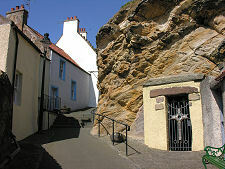 In the 1930s the cave was re-dedicated and services are still held there. The key is available locally. 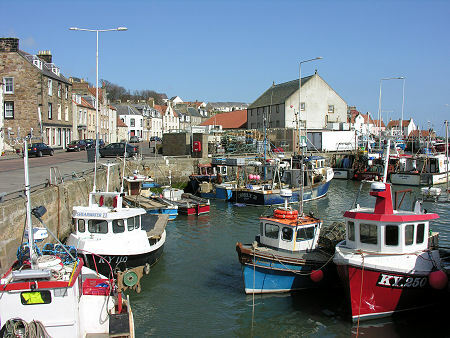 Pittenweem's harbour was greatly expanded by Sir John Anstruther in the years from 1770. He needed a port to ship the coal being mined from under his land, and salt being produced by the saltpans he built on the shore below St Monans Windmill, which was built to pump sea water into the salt pans. Sir John expanded the harbour on condition his ships had priority over other traffic. Both the saltpans and coal mines were linked to Pittenweem Harbour by a waggonway. 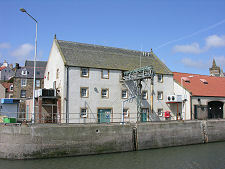 The enterprise was short lived, but the impact on the prosperity of Pittenweem from the improved harbour was long term. 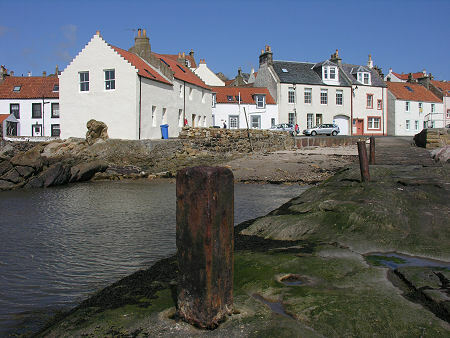 You can read the full text of the chapter about Pittenweem in D Hay Fleming's 1886 book: Guide to the East Neuk of Fife.